Will you dare to search for the golden city? Assemble your expedition and lead it through the jungles of South America in this deck-building board game*. You need to have a good plan, expert explorers, and the right equipment. Will you choose the scout, the photographer, or the prop plane? It is up to you to find the best route through the wilderness with your team and to win the race to El Dorado! Every route is a new challenge. Every game needs a new strategy! This game is my new favorite. You can customize the game to make it last as long as you want (which can save you from the marathon game) and also many different board variations allow you to replay without the game getting stale. I am new to deck building games, and now I love this mechanic. This was a fun game for our family and I can’t wait for the next game night to show my friends. a new classic for sure. 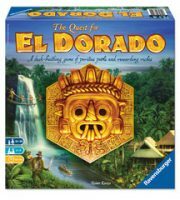 Add a Review for "The Quest for El Dorado"